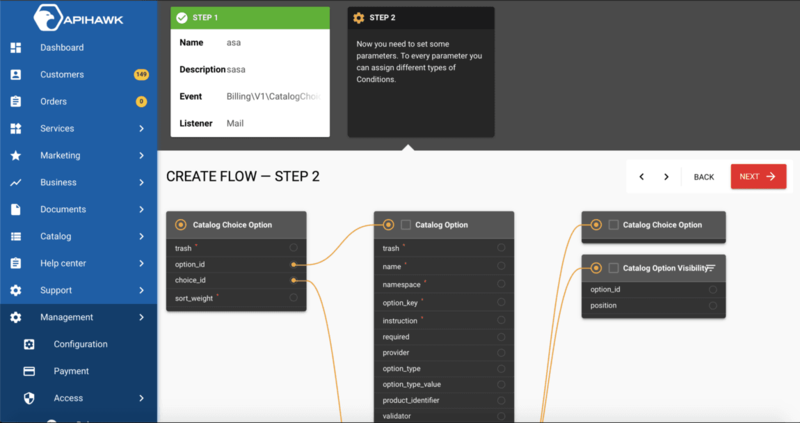 We're super excited to share a lot of awesome additions now available in Billia 3.5! We've improved customer satisfaction with new Billia Store software, monetisation security with new Payment Gateway, Enterprise Mail support in AppCell via cMailPro and plenty more..
Billia is our Next Generation Billing & Automation Software designed by hosters for hosters. [Billia Store] New! New! New! We are presenting something fabulous, something HUUGE. After months of hard work and precise development ApiHawk is releasing Billia Store – a powerful and flexible software that helps you sell your products in a smart and efficient way. The solution guides the buyer in every step of their purchasing process while constantly adding value to the items that are already in their shopping cart. 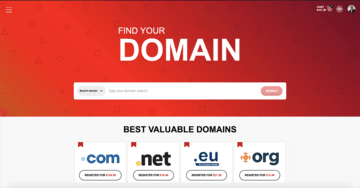 With Billia Store you can sell almost everything from shared hosting and domains to SSL, cloud and e-mail solutions plus other products and services from one place. Everything is controlled by Billia meaning that the whole process is as flexible as possible. 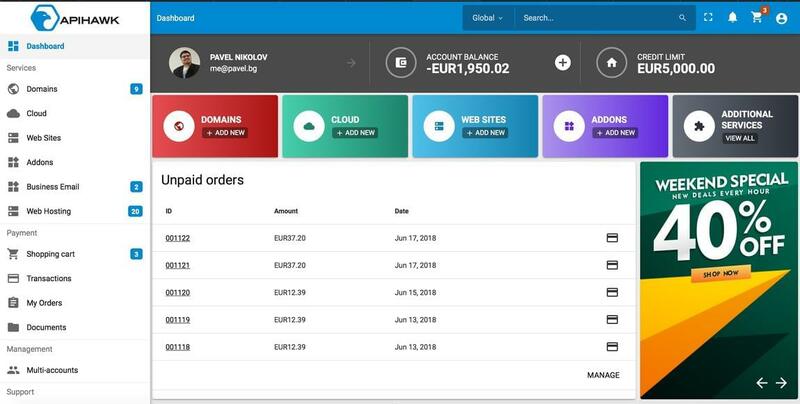 [Payment Gateway] New software in the portfolio of the company. Dedicated all in one multi payment gateway. 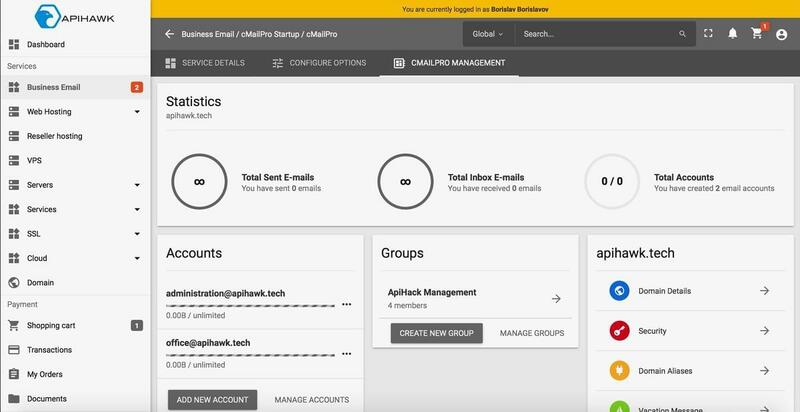 Added powerful plugin for managing cMailPro/CommuniGate Pro, with a huge number of features. The plugin is giving you a Rest API for working with the Communigate’s software and CG/PL language. Flexible monetization per mailbox and quota. [Customer Panel] New Dashboard with improved UI, Recent Tickets, Active Services & Products. We are announcing new dashboard for customer panel with latest tickets, active services & products and advertising banners, where your team can present new and hot products. Support for logging in the system by using the credentials of one of the social platforms that you use (Facebook, Twitter, LinkedIn, etc.). [API] Added Console Welcome message. Improved console funcitonalities. The system will collect and print all available console commands and what is the purpose. Extremely helpful when controlling workers and cron scripts. Branding Management is designed to store all branding related content. Logo, colours, support email, phone numbers, etc. System branding is holding information for the current branding of the softwares. You have key-value storage for all kind of variables, related to the client/application, which is requesting the software. 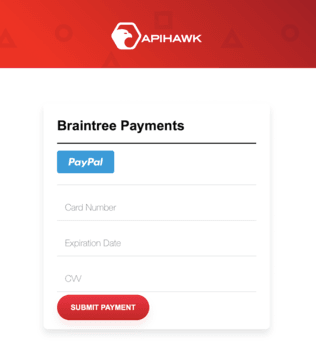 The resource supports also "default branding", connected to client_id: apihawk[default_client], which will be used as failsafe, if you client do not support all branding components. 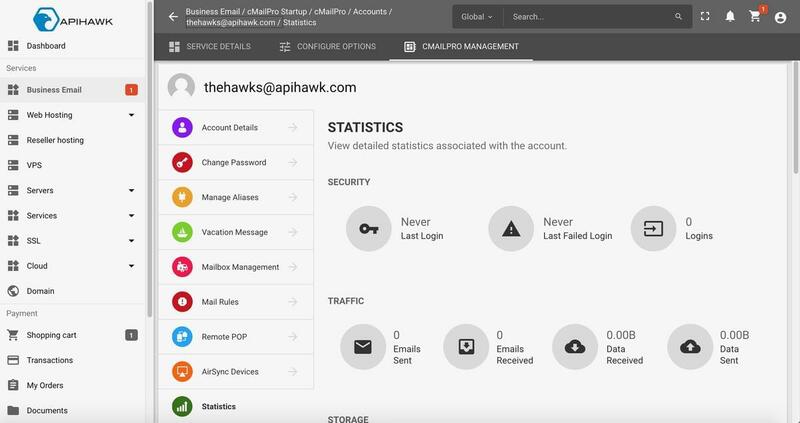 Added IP protection to all accounts in the system. 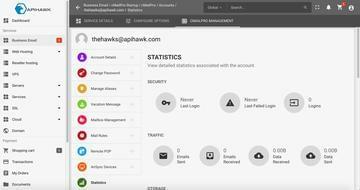 Admin and User can now add IPs, which are allowed to access the account. 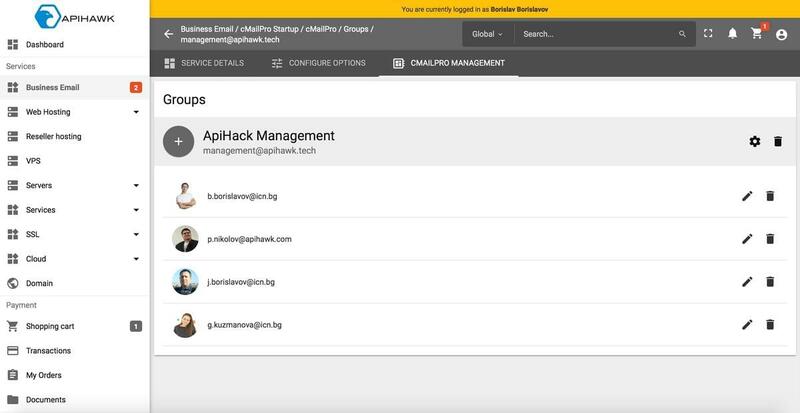 Administrators can manage all users IPs and whitelist or blacklist them. The IP protection service is supporting: IPv4 & IPv6 as well as ranges in both versions. You can specify network ranges which have access to a specific account. Added EU VAT validator and information fetcher. The service is depending on 3rd party service (https://apilayer.net), for validating the VAT numbers. 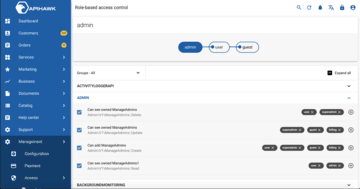 [Management Panel] RBAC functionality redesigned and improved. [API] Added newsletter sending functionality to all customers subscribed to GDPR marketing list. The service is using build in MJML templating service to create and send beautiful and responsive emails. [AppCell] Added Registry.EU plugin with provisioning domains support. 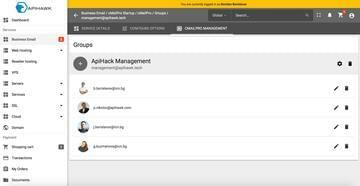 [AppCell] Refactored Plesk plugin. Major functionalities are included for: products, billing, customer, site, webspace. All CRUD related functions are standard for Plesk servers. [AppCell] Created “Legacy” Plugin, used for selling non automated products. The Legacy Plugin will return an error and will send email to a specified email address, to explain to an employee what task should be done. After the support or administrator is done with the provisioning, should change the order status to provisioned, which will trigger rest of the functionalities. [AppCell] Created RegistryBG Semi-Automated module. The module is working like “Legacy” but have automated AvailabilityCheck done through register.bg and imena.bg who is servers. [AppCell] Completely refactored Ficora (.fi) plugin, due to backward incompatibilities and GDPR changes. [Customer portal] Added a new payment confirmation page to indicate the state of customer payments: successful, failed, pending. The page also provides a list of purchase items. [Customer Portal] Updated front-end support for group options in shopping cart. This allows for all options to be rendered and ordered correctly from the API. Options can now be toggled dynamically via radio buttons or check boxes. Option data is also successfully been set based on the option choice selected from the group. If item is not configured properly the customer is restricted from being able to check out. [Management panel] Added a new manual invoices page. This allows for creating manual invoices to be sent to the customer based on specific requests. Manual invoices that can be created include proform document, invoice, debit note, and credit note. The page allows for auto populate of products based on customer purchase or for manually entering purchase data. The document can be downloaded and emailed to the customer. [Management panel] Added new functionality for cloning products in the system. It allows you to create a new product based on existing product settings. Main fields need to be updated to differentiate between products in the system. Faster and more efficient creation of similar products is achieved. [Management panel] Added an AppCell plugin Installation functionality that automatically configures the necessary plugin for each new product in the system. [Management panel] GDPR requirements are now being met by the system. Users accepting GDPR terms and conditions are now registered in the system with exact time and date of acceptance. Added additional functionality for manual registry of users to the GDPR list. Admin users can now manually subscribe users’ email along with adding notes for the manual subscription. Admin users can also upload document/email/screenshot related to the manual subscription that can be used as proof that customers have requested to be added to the GDPR marketing list. Reasons for unsubscribing from the list are also recorded in the system. 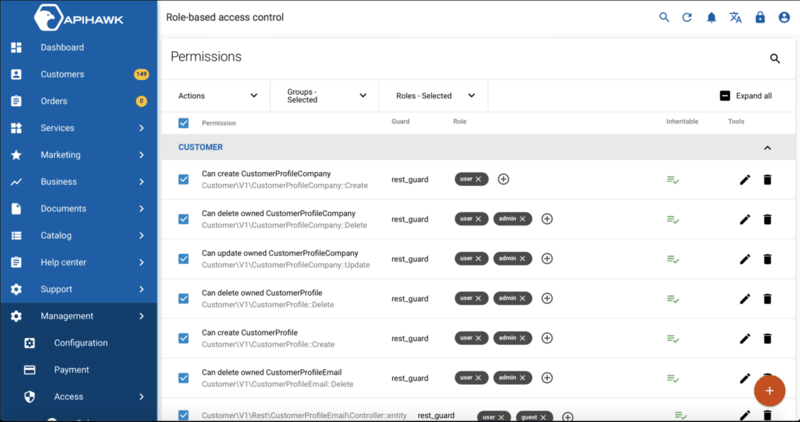 [Management panel] Added indicator for each customers email if it has accepted GDPR terms and conditions. [Management panel] Updated layout of the roles and permissions page. 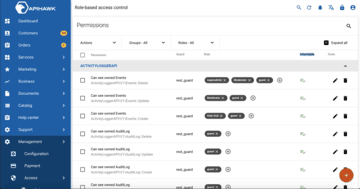 This greatly improves the user experience for setting and managing the roles and permissions for users in the system. 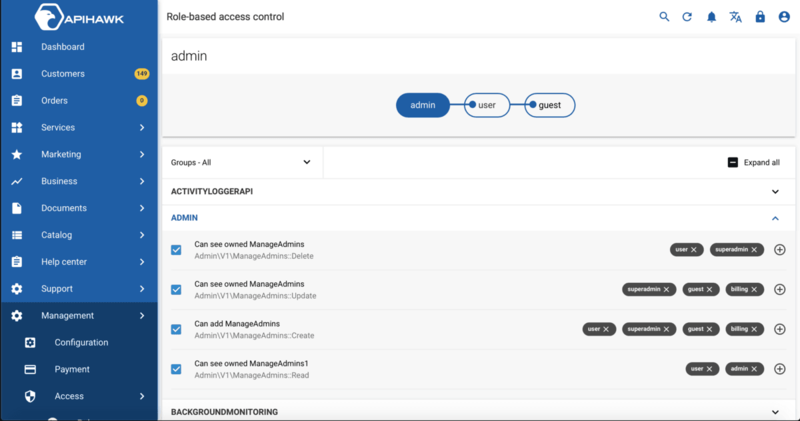 [Management panel] Updated layout of the Eventor module. This also improves the user experience for managing events in the system. 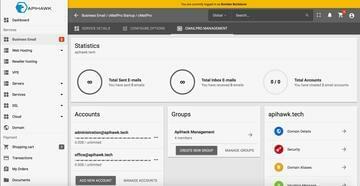 [Management panel] Improved banner management. Added multi-language support for banner description. Added copy/paste functionality for banners. [Management Panel] Two end points in the management panel were found to return 404 error. Configuration describing these paths was added to "modules-available.json" for resolving the issue. [Customer Portal] Hardcoded variables for CSV options in shopping card are now pared dynamically. [API] Improvement in PremiumDomain Module to send two request to DomainsBot, for fetching registered and available domains for better UX. [API] Speed optimisation in SearchModule not to open socket to RBMQ and Elastic on every request. [API] Improvements in TAX calculations on “tax_excluded” mode. [API] Improved 401 message: The user must be logged in to make this API request. Check the value of the Authorization HTTP request header. [API] Fix in user finder RPC to fetch emails for a specific profile, not the whole account. [API] Fix in Product Quantity Calculation to return the right price for all quantities. [API] Fixed validation error on adding empty language string. [API] Fixed huge issue with event triggering, which was responsible for not clearing in memory cache, while making more than one operations in one request. [API] AuditLog will not duplicate data on patch/put and will provide information when the system is doing any change. [API] Fixed Workdays in JSON response to properly return weekly work days. [API] Resolved error when trying to create contacts for Registry.eu. [AppCell] On missing plugin, module, customer product or params, the software will return error 404 Not Found, not 500 Internal Server Error . 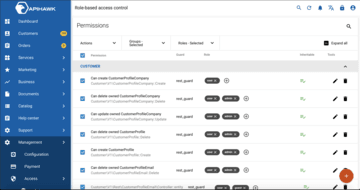 [Management panel] Fixed issues when creating a new customer in the management panel. Implemented character verification for all fields in order to accept only permitted values. [Customer Panel] Fix issue with the dashboard if not enough categories registered in the system. [Help center] Updated functionality to allow user to search content by content tags.